So we got a dog. It's been over a month now, so I guess it's time to accept the fact that it is "working out" and we're going to keep him. It would be too much trauma to give the poor thing to someone else now that we taught the unfortunate beast to answer to "Groot." Yeah, the name was my idea. I guess I'm weird, but so is this dog. He's a lab, so he's a chewer. And he swallows. It's as much work finding him things that are safe to chew as it is catching and taking away the things that aren't safe. And when he chews the hands off the Barbie dolls (and spits them out, so the kids find them later), it's an entirely different risk to his safety. His interests include people, anything that moves, the outdoors, dead things, and poop. We got him from the Humane Society, aged young-enough-to-act-like-a-puppy-but-old-enough-to-be-already-enormous. Because we're smart like that. Oh, and last of all, he's an escape artist. So while it is entirely unsafe to leave him in the house, garage or shop when we have to be gone (because he always finds things to destroy), it is impossible to confine him in the yard. And so what is his redeeming feature? Just one, and it's enough. He's a dog. It's completely irrational, how much I love the shape of his doggy nose, or the expressions he makes with those arched "eyebrows" over his brown eyes. They exude sincerity. Looking into them, you know that he cannot tell a lie. (He can chew down the cherry tree, but he'll fess up about it later.) I grumble, and I growl, and a few minutes later I am scratching him behind the ears gushing to him about how much I love him. I used to get up in the morning and take him outside to pee because I was afraid of having to clean up the mess if I didn't. Now? I am so over that fear--been there, done that, can do it any time I need to. But I get up and take him outside because I don't want him to uncomfortable or anxious. It makes no sense. The mutt doesn't even do any work. He costs money, he has no sense of personal space, and he drools. But I love him. It doesn't have to make sense. It's love. 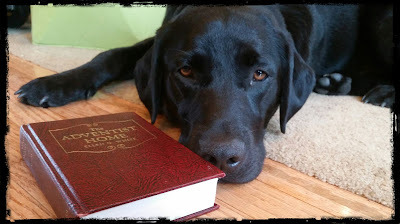 And that is what makes him a genuine, orthodox, Adventist dog. Besides the fact that he doesn't eat pork (mostly because he hasn't found any dead in the woods behind the house yet). It's because he's a sermon illustration. He reminds me what love is. This is love. It exists for its own sake--it isn't earned, it isn't deserved, and it doesn't make sense. It has nothing to do with the benefits I get (or don't) in return. It has nothing to do with his merits. As I kiss my smelly dog, and try not to think about what he rolled it to get that smell, there is a new depth in the words "God so loved the world." God loves us, just because he loves us. You don't deserve love--well, probably you do, but that's not the point. Love is not a by-product of deserving. It exists for its own sake. God doesn't need a reason to love you. He just does. God loved us enough to come join us--to become one of us, and deal with the smelliest stuff we have to offer. And he didn't do it because we're going to earn our keep, or because we're so obedient, or because of what we have or haven't rolled in. He loves us because we are humans, and because he is God.